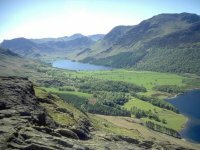 After some rather iffy weather during the Whitsun week of 2005 the sun has finally come out and I've decided to climb one of Lakeland's "tiddlers", Rannerdale Knotts near Buttermere. 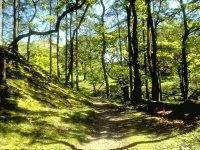 The walk features this delightful "Alpine" start, a stroll through Ghyll Wood. 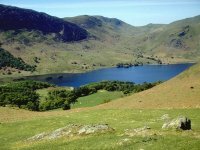 Once beyond Ghyll Wood there's a short but steep scramble up a bracken slope to gain Whiteless Breast, north of Crummock Water. Already there's a fine view back to Buttermere village with High Stile beyond. 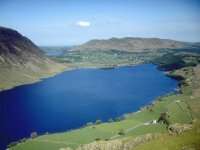 From the same point this is the view of neighbouring Crummock Water. 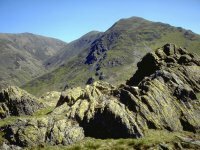 The route to Rannerdale Knotts leaves Whiteless Breast to the left. Looking back at Buttermere and the surrounding fells. 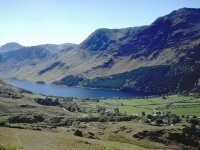 Buttermere and High Stile from the southeastern spur of Rannerdale Knotts. This is the summit of Rannerdale Knotts, 1160ft high, and only 45 minutes' walk from Buttermere. If anyone asks which Lakeland fell is suitable for a complete novice, I recommend this one. For a minimum of effort you get great views and superb scenery. Rannerdale Knotts has a surprisingly rocky summit for a fell of such modest height. 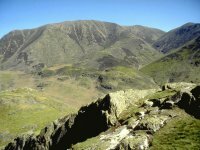 Here we're looking due north to Grasmoor, with Gasgale Gill to the left. Looking back to Buttermere and Crummock Water from the rocky shelf of the summit. 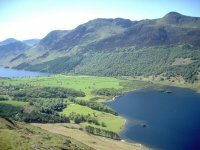 From here it's easy to appreciate that Buttermere and Crummock Water were once one big lake, part of which has now silted up to form the meadows northwest of Buttermere village. 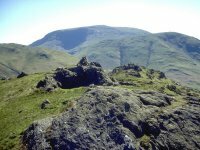 Robinson and Hindscarth seen from the summit of Rannerdale Knotts. It's an irresistable view. High Crag, High Stile and Red Pike behind Buttermere and Crummock. 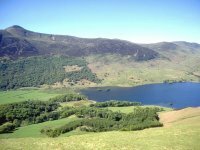 Looking the other way across Crummock Water we can see Loweswater beyond, just to the right of the steep slopes of Mellbreak. 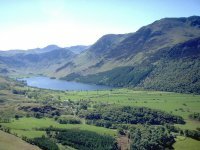 Just one last shot of that arresting view of the meadows between Buttermere and Crummock Water. 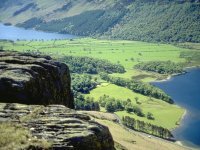 To the northwest the colourful screes of Whiteside are seen to advantage. I'm on my way back down to Buttermere village but I can't resist a last shot of Crummock Water. 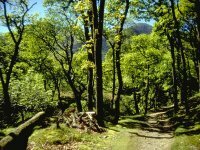 The return through Ghyll Wood, which Wainwright barely mentions in his guides. 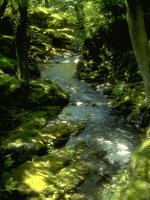 This shot is a little blurred due to the slow shutter speed necessary in the shade, but the stream through the wood is especially pretty.